Earlier this month, Nintendo released the first DLC pack for the Legend of Zelda Breath of the Wild. Titled the Master Trials, it contained a new harder Master Mode, the special Trial of the Sword bonus gauntlet and new pieces of armour among other things. But while that was an interesting DLC pack, it’s not really the most important one. Oh no, that label can be applied to the Champion’s Ballad one due this winter. And guess what? Nintendo’s finally shown some footage of it! As you can see, it heavily focuses on Zelda as a main character, and involves visiting quite a few parts of Hyrule that you went to before. These areas include Gerudo Town and what appears to be part of the Hebra region, implying that the new storyline has the main characters travel all across Hyrule for the purposes of their mission. And that’s not the only interesting thing. Oh no, do you notice something else that seems odd here? Like the shrine? Yep, it’s active. But as you may know from playing Breath of the Wild, this wasn’t the case before the Calamity. 100 years ago, the towers weren’t active and hence the shrines never glowed or did anything interesting. But they are here. So it seems like the DLC pack may be set during or after the main storyline, not as part of a prequel like many people were expecting. 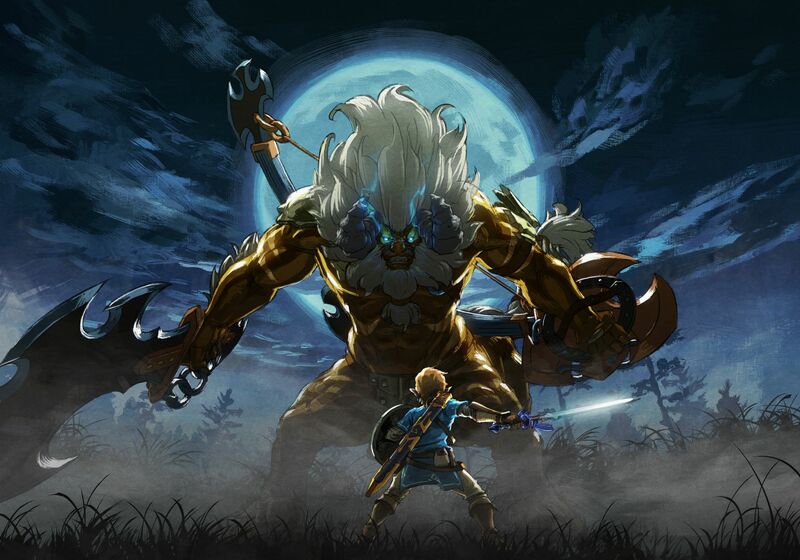 It also won’t (contrary to other speculation) star Zelda or the champions as the main character. Oh sure, she plays a big role in the DLC pack, but she’s not the main protagonist. Instead, Link is the main hero like in the main game and prior DLC. What’s more, it also won’t purely be dedicated to the new dungeon or storyline. Again, they’re a major part of it, but they’re not the whole thing. So yes, your armour selection will be expanded in this DLC pack. And this in turn makes the chances of another DLC pack afterwards even lower. Why? Well at the moment, there is a maximum armour limit of 100 in your inventory. In other words, you cannot collect more than five pages worth of armour before any new stuff gets lost forever or made impossible to pick up. However, we already have a maximum of 90 pieces of armour thanks to the in game gear, Amiibos and DLC. As a result, unless Nintendo decides to overhaul the inventory system, there’s only room for one DLC pack’s worth of new armour in the inventory. This makes it likely that the Champion’s Ballad is the last pack for the game. Still, that’s just my speculation on the matter. As for the DLC pack as a whole though, it looks good. You’ve got some interesting extra clothing options, what appears to be a massive Hyrule spanning storyline… the works really. Let’s just hope it lives up to expectations in the end, okay?